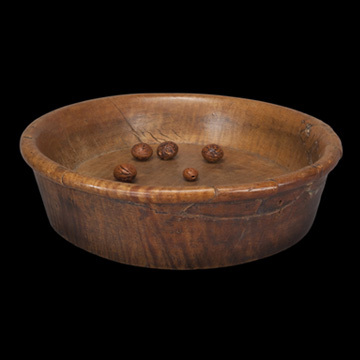 Bowls such as this example were used for a traditional Woodlands game involving peach pits. Only a few gaming bowls are known, and most have breaks with period repairs, as game play involved slamming the bowl into a blanket, which caused the peach pits to bounce into patterns that determined the winner but sometimes caused the bowl to shatter. On this example, the ancient repairs are testament to the vigor with which the game was played. A gaming dish of nearly identical form, also with breaks and period repairs, is in the collection of the Smithsonian Institution.